1950 S. Santa Fe Ave.
Curated by photographer Joe Wolek, On the Distant Horizon explores notions of mirage — something that is simultaneously there and not there. Focusing on interpretations of chimera, delusion, hallucination, specter; a potential figment of the imagination; a castle in the air. Artists: Nadege Monchera Baer, Dani Dodge, Andrew Freeman, Todd Gray, Ben Jackel, Michael Isenberg, Alanna Marcelletti, Hanna Mattes, Jesus Max, Joey Morris, Ruben Ortiz-Torres, Julia Paull, Max Rain, Christopher Rauschenberg, Shelby Roberts, Amy Russell, Mitchell Syrop, Rueben Ortiz-Torres, Augusta Wood, Kim Ye, and Kent Young. Organized by Joanne Logstrup and Pia Ronicke. 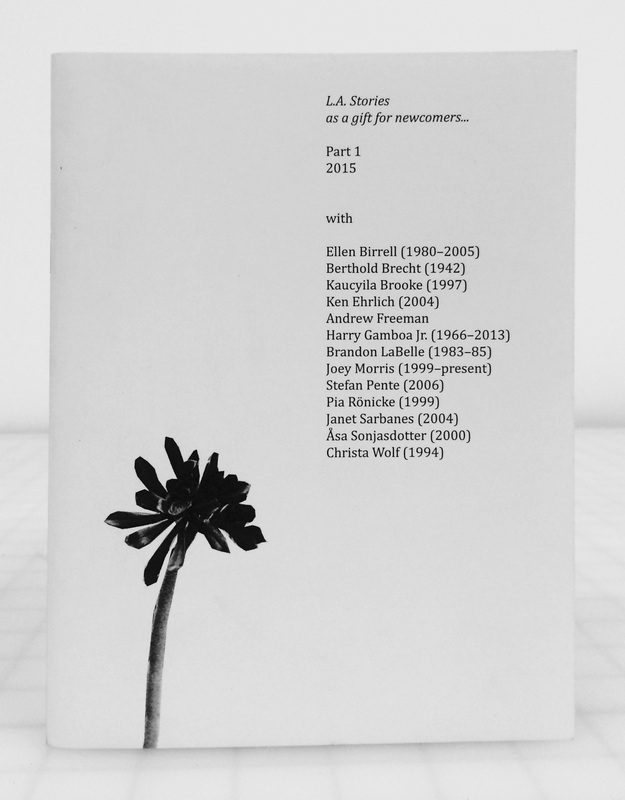 A cloth-bound, hard cover book documenting the history of Las Cienegas Projects, an artist-run project space in Los Angeles operating between 2009-2011. Opening its doors during the peak of the Great Recession, Las Cienegas Projects singularly bridged the wide-ranging art communities and diverse practices of Los Angeles, serving, in the words of artist, scholar, and educator Charles Gaines, as “an alternative to the alternative space”. Three Los Angeles based artists premiere new and in-progress works exploring similar themes that are reminiscent of home movies. Lee Anne Schmitt works in film, writing, photography, and performance to create work that elevates the everyday elements of American life towards the level of cultural ritual. Andrew Freeman is a photographer, writer, filmmaker and occasional curator. He has exhibited both nationally and internationally. Nick Flessa is a filmmaker, musician and visual artist. All three will show new works and will be in attendance for discussion. Limited First Edition of 500. 152 pages, 7.25 x 10 inches. In the 19th century, the built environment served as one of the best subjects for early photographers—one that could remain motionless for the required lengthy exposures. Architecture as a recurring subject was well-suited to the capacity of photography to document facts and capture pure form, shape, and shadow. In addition, architectural imagery highlights the intimate human experience of buildings—their creation, use, and decline—making manifest our shared histories and the photographic pathos of a still life meant to stand beyond our lifetime. Coinciding with Modern Architecture in L.A., a city-wide exhibition program organized by the J. Paul Getty Museum, this exhibition turns our focus to architecture in transition, in either the nascent stages of construction or deconstruction. Structures once viewed as solid and impassive read here as more abstract entities, with layers and complexities writ by photography. The exhibition includes work by Thomas J. Annan, Eugène Atget, Lewis Baltz, Richard Barnes, Manuel Carrillo, Lois Conner, Stéphane Couturier, William Current, Andrew Freeman, Simryn Gill, Grant Mudford, Simon Norfolk, and James Welling. In Our Sights is an experiment in pushing the documentary form into a more personal and intimate space. While the document and the archive is still important, as is the research that underpins the re-telling of any story, the delivery of this information will be questionably unmediated. Or, at least, less mediated than in a traditional documentary film. In Our Sights borrows from the oral tradition, and invites the audience into an installation where artists will perform memories and engage with you in conversations. So that you become as much a part of the re-telling of this story as the story itself. The future starts in Wendover, Utah. It was here that the bombardiers trained to drop the atomic bombs on Japan. This training facility was also training the world to see and experience differently, it prepared us without us knowing, for a new subjectivity. The immaculate conception of the nuclear bomb, with its Trinity test and press conferences in Japan, ushered in the era of the radioactive sublime. Soon we would all become disciples of technology as an ideology, a theology and the only thing left to believe in. Downstairs in the target range Mireya Lucio and Nathan Lam Vuong will each conduct one-on-one performances that weave together personal memories, fragments and stories key to their identity formation inside and against the larger forces of history, ideology and technology. LA><ART is proud to host Mario Pfeifer: Reconsidering The new Industrial Parks near Irvine, California by Lewis Baltz, 1974. In a panel discussion – for the book’s first presentation in the US – speakers Allan Sekula, Catherine Taft and Mario Pfeifer will discuss possible answers to the inherent questions and furthermore investigate notions of Representation / Reproduction / Realism in these works, paired with critical observations of labor depiction within socio-political and conceptual art practices in the 1970’s until today. Andrew Freeman will be moderating the discussion.